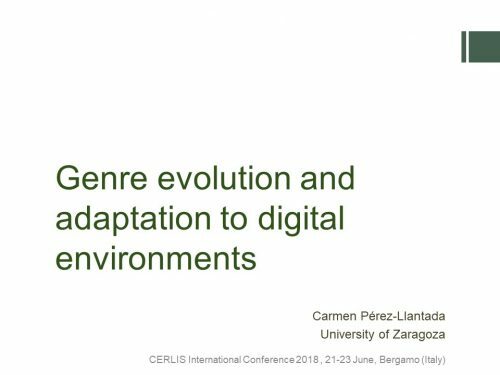 Carmen-Perez Llantada gave a plenary lecture on genre evolution and adaptation in digital environments. Communicating research beyond expert audiences with the support of digital media has triggered innovative science dissemination practices. To genre analysts, these practices invite enquiry into the ways in which traditional genres that are strongly stabilized and typified texts (e.g. the research article, the abstract or the grant proposal) evolve and are adapted to the functionalities available in digital platforms. Taking the case of the crowdfunding proposal, this talk examines how its generic precedent, the ‘stabilized-enough’ genre of the grant proposal, profits from the affordances of digitally-mediated production with the purpose of engaging the public in science and, at the same time, garnering funds. Using the frameworks of rhetoric and communication and genre studies (Miller, 2016; Swales, 1990), I will apply linguistic and rhetorical analysis to explore the genre interdependency between the crowdfunding proposal and its generic precedent (in terms of service attitude, future-oriented, project-centred, persuasive rhetoric, personal tone, brevity and accessible language) (Porter, 2007). I will also apply visual rhetoric to describe how the semiotic modes other than writing that accompany the crowdfunding proposal enhance the persuasive appeal of its textual contents. Considering that scientists are increasingly being expected to share scientific research with the public, I will conclude with some pedagogical considerations. María José Luzón presented a paper on the function of visuals in academic websites. The websites of research groups have emerged as a new genre that enables them to inform about their research field and activity. Research groups use the affordances of the digital medium to include information in a variety of formats (text, images, videos, animations, data sets, interactive elements), which contribute to providing visual evidence and engaging the audience. Some of these formats (e.g. photos, videos) also help to disseminate information about science to the lay public and bridge the gap between experts and the public. 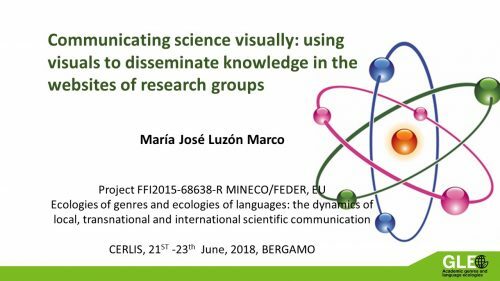 In this paper, I analyse the visuals (images, video, animations) used in the websites of research groups in a Spanish University, to determine how they contribute to disseminating knowledge to different audiences. The research is intended to answer the following questions: What types of visuals are used by research groups in their websites and what are the functions of these visuals? What is the relation between visuals and the accompanying text? What is the relation (if any) between the types of visuals and the discipline of the groups? How are these visuals used to engage different audiences?